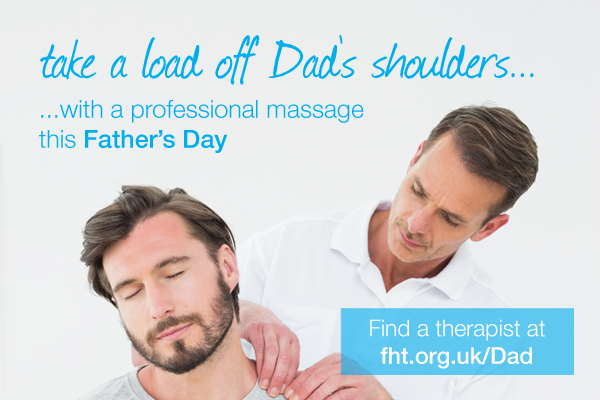 The FHT has produced the above social media advert for you to promote your therapy practice this Father’s Day. Simply visit our Facebook page to ‘share’ it or visit our Twitter page to ‘re-tweet’ it, along with your contact details. Adverts can also be printed at postcard size – just click to full size, then print. Looking for other social media adverts to promote your therapies this year? Leave your suggestions below. Posted on 12 June, 2015 by Federation of Holistic Therapists (FHT). This entry was posted in business, news and tagged social media advert. Bookmark the permalink.